Fresh cherries? Yum! Their sweet flavor makes for such wonderful pies, tarts, and other dessert goodies. But, hey, cherries can do savory too. As this recipe shows. 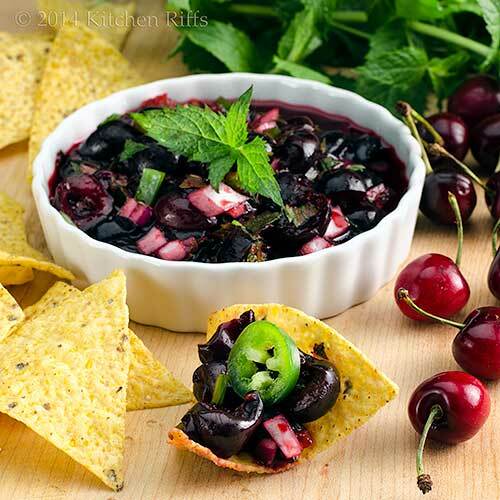 Just combine cherries with spicy chipotle and jalapeño chilies in a rich salsa. The result? A tasty and versatile dish that fits in anywhere. Serve it as a first course with chips. Or use it as a sauce to accompany pork, fish, or chicken. Best of all, Chipotle Cherry Salsa is simple to prepare. And with peak cherry season upon us in much of the US, now is the perfect time to try it. Salsa means sauce in Spanish. Many salas are tomato based, like our own Salsa and Picante Sauce. But you can make flavorful salsas with fruit—stone fruit in particular. Examples? Take a look at our Peach Salsa or Plum Salsa. Salsas are fun to play around with in the kitchen—you can vary ingredients and quantities to suit your individual palate. So feel free to adjust this recipe to your taste. This dish is best when made with fresh cherries. But if you have access to good frozen cherries (Costco offers some great ones), those make a convenient substitute. Diana Kennedy has an excellent chapter on salsas in The Cuisines of Mexico. I borrowed some of her basic ideas for salsa-making when I developed my recipe. This dish takes about 15 minutes to make. You can serve it right away, or chill it and serve later (I think it tastes better if you allow the flavors to mingle for about 15 minutes). Pit the cherries: Wash and dry the cherries and remove their stems. Use a cherry pitter to remove pits. (If you don’t have a cherry pitter, you can push the pits out with a pastry tip, a paper clip that’s been straightened, or a chop stick. Or so I’ve read—we have a cherry pitter, so I haven’t had to experiment.) Cut the pitted cherries into halves or quarters (see Notes). Set aside. Pour a 7-ounce can of chipotle chilies (including their accompanying sauce) into a mini food processor, then pulse until puréed. Place 1 tablespoon (or to taste) in a medium mixing bowl. (Refrigerate the remaining chipotle purée in an airtight container—see Notes). Add the lime juice to the chipotle purée and mix to combine. Add the cherries to the mixture. Peel and mince the red onion (a mini food processor works well for mincing; the smaller the pieces are, the better—but don’t obsess about mincing too finely; see Notes). Add the minced onion to the mixing bowl containing the cherries. Wash the jalapeño pepper(s) and cut off the stem tips. Then cut the peppers in half lengthwise. Use a teaspoon to scoop out the ribs and seeds (be careful, the oil on these is hot; keep fingers away from your eyes). Chop the jalapeño peppers into very small dice (again, a mini food processor works well; if you go this route, you can dice the peppers along with the red onion). Add the diced jalapeño peppers to the mixing bowl containing the cherries. Then wash your hands with soap and water to remove the hot jalapeño oil from your skin. Wash, dry, and stem the mint, then mince it finely. Add it to the mixing bowl. You can serve Chipotle Cherry Salsa immediately, but I think it improves if you let it sit for 15 minutes or so (refrigerate if it’s going to sit for longer). When ready to serve, garnish with jalapeño slices or mint leaves, if you wish. How small should you dice the cherries (and other ingredients) for this recipe? It depends on how you want to use the salsa. If you plan to dip chips, it makes sense to dice the ingredients fairly fine. To achieve this, I sometimes pulse the ingredients in the food processor—being careful not to overdo it (which can turn everything to mush). When using a food processor, I often pulse all the ingredients together, rather than dicing them individually. When I’m serving Chipotle Cherry Salsa as a sauce with fish or meat, I tend to like the ingredients to be a bit chunkier. So in that case, I usually dice everything by hand (it takes only a few minutes). But you can still use a food processor if you’re careful not to pulse too long. In the US, canned chipotle chilies tend to be sold in 7-ounce containers (most grocery stores carry them in their Mexican food sections). The canned chilies are packed in adobo sauce, which has a tasty vinegar base. After you pulse the canned chipotle peppers in a mini food processor and measure out the amount you need for the recipe (Step 2), place the remaining purée in an airtight container and store it in the refrigerator. It will keep for weeks (even months, probably). BTW, chipotle chilies are smoke-dried jalapeños. So they’re spicy. If you’re sensitive to spicy, you might want to use a bit less chipotle than the recipe calls for. Or if you’re like us, you may want to use a bit more. Remember that you’re also using fresh jalapeño peppers in this recipe—so you’re getting a double dose of spicy. That works for us, but you may prefer to tamp the heat down a bit. Sugar can mask hot, spicy flavors. So if you put too much chipotle or jalapeño pepper in your Chipotle Cherry Salsa, adding sugar will make it more palatable. Sugar will also make the salsa sweeter, of course. Unless the cherries I use are very sweet, I tend to welcome a bit of added sugar. Once you know how to make one salsa, you basically know how to make them all. The essential salsa elements are: a base ingredient (cherries in this recipe); an aromatic like onion or shallots; a fresh herb (cilantro, mint, parsley—whatever you think would work); usually a bit of acid to balance the mixture (lime or lemon juice; sometimes vinegar works too); a “ping” ingredient (chipotle and jalapeño peppers in this case; sometimes ginger or garlic); and (usually) salt and pepper to add the final tone to the dish. Feel free to play with flavors you like to develop your own “house” salsa. “Some of the ingredients are dicey,” I said. “Guess it was mint to be,” said Mrs K R.
Good morning John , cherries here aplenty , you posted this dish right on time . Father's Day is Sunday , we have a cookout each Father's Day and this salsa will hit the spot . It will be doing double duty , for a salsa and sauce for the meats and love the heat . Thanks for sharing :). Hi Nee, many cherries here. ;-) The heat on this is really nice -- you'll like. Thanks for the comment. WOW! Cherry salsa? I never thought is using cherry for salsa...indeed looks delicious with a touch of spice...thanks for the recipe John. Cherries are my all-time favorite fruit, I love this with the chipotle bet this is delicious! You mentioned this salsa on Blue Kitchen's site and I thought it would be perfect for grilled pork tenderloin. I will Definitely make this. The cherry salsa is new to me. I like how you combined the Chipotle flavor in it!!! Love this - I am a big fan of cherries with hot flavors. I love cherries and chipotle pepper! A little sweet heat is good for the soul and the tongue. This looks so good. This is an interesting flavorful combination of savory and sweet. This is a perfect addition for Father's day gathering treats. This is a good post, John. Thank you! Hi Juliana, isn't this a great idea? So flavorful! Thanks for the comment. Hi Cheri, I love cherries too! And yes, this is delish. ;-) Thanks for the comment. Hi Anonymous, this is perfect with tenderloin (which is what you see in the pictures). Thanks for the comment. Hi Shibi, it's a great dish IMO -- loads of flavor. Plus something a bit different. Thanks for the comment. Hi Alyssa, cherries and spice work really well together, don't they? Great combo! Thanks for the comment. Hi Karen, don't cherries and chipotle pair so well? They make such a lovely flavor. Thanks for the comment. Hi Ray, this really is great for a cookout or BBQ. Thanks for the comment. Salsa sure is good even when you are in the pits! And leave the tomato kind for when cherries aren't in season. What a great recipe you've given us, John! And I'm not mincing my words. Hi Abbe, LOL! Puns are so much fun, aren't they? As is this salsa. ;-) Thanks for the comment. I love the combination of sweet and spicy...This is so versatile since it can be used as a dip or to accompany pork and other white meats. I have never had cherry salsa, very interesting combo of flavors. The tangy sauce would probably go very well with BBQs as well. Looks gorgeous too. Hi Pat, cherries (and other fruits) so often handle spicy hot stuff really well. Glad to set your mind spinning! ;-) Thanks for the comment. Hi Denise, this is one of those recipes that go so well with a lot of things. It's really a fun one! Thanks for the comment. Hi Minnie, the sauce works well with BBQ. Or grilled salmon! So versatile. ;-) Thanks for the comment. My mouth is in heaven right now just thinking about this salsa! Talk about the ultimate in sweet and spicy flavors. Very creative my dear! Wish I had some cherries right now because I have a pork loin in the refrigerator screaming for this salsa! Hi MJ, this dish is dynamite with pork loin. Worth a trip to the store to get some cherries if you're cooking pork. ;-) Thanks for the comment. Chipolte and CHERRY! NEVER would have even thought of this combination! Interesting combination. It looks great on the chips! I love the food talk in that dialogue, lol. Diane Kennedy's book is fabulous! I don't recall this recipe though. I'll just keep yours:) Cherry season is a bit late here in central PA. Hopefully it will arive soon because this Cherry Salsa just may be what the doctor ordered. I'd love to try it on pork or chicken. I bet it's delicious! Hi GiGi, it's a great combo - sooo worth trying. ;-) Thanks for the comment. Hi Julie, isn't this interesting? And it tastes so great! Thanks for the comment. Hi Louise, not really Diane's recipe, but I use the principles I learned from her to create it. ;-) This really is wonderful stuff with pork or chicken (or fish). Totally delish. Thanks for the comment. This looks incredible! I love cherries in sweet preparations. But wow, the pickled ones are mind-blowing. So I can only imagine how amazing this salsa version is. Hi Carolyn, it's really good! One of the better things I've done this year, IMO. ;-) Thanks for the comment. 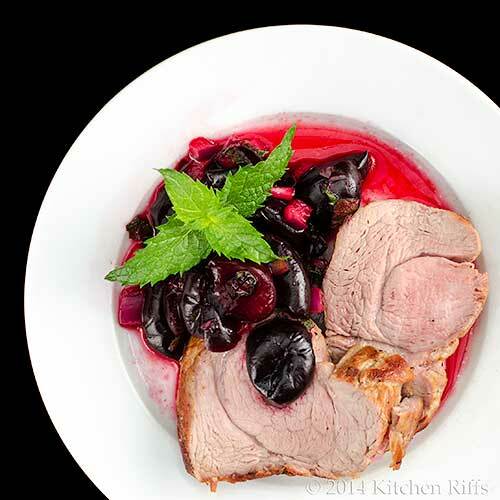 LOVE cherries in savory applications: they work so well and totally hold their own, and i'm sure this is no exception. you've got a nice dose of heat in here too, which is always lovely with any stone fruit, for sure. i'm imagining this on some sort of pork thing here at the house very soon. A delightful and original salsa! Perfect with meat, fish or even cheese (halloumi/feta). Well, hey , you win most creative recipe of the month for sure! One chef that I used to work with made marinated cherries to serve with pork and they were out of the world, and I love your Southwest version! I also like that you left the cherries in fairly large pieces. Hi Kumar, this really does rock! ;-) Thanks for the comment. Hi Candy, all gone, sorry. ;-) But I'll make some more for you! Thanks for the comment. Hi Shannon, although cherries are excellent in sweet things, in a lot of ways they work better in savory dishes -- they add such interesting flavor. And they reveal new dimensions in savory dishes. This dish combines wonderfully with pork. Thanks for the comment. Hi Rocquie, pitting cherries is, well, the pits. ;-) But as you say, worth it. And good frozen ones are decent (although they do have a tendency to get soft; not really a problem in this dish). Thanks for the comment. Hi Rosa, pairing this with cheese is a wonderful idea! Definitely something I'll do. Thanks for the comment. Hi Dawn, isn't this nice? Tasty and fun -- can't beat that! Thanks for the comment. Hi Mireya, marinated cherries are good. I've had them, though never made them. And I do like a chunky salsa, particularly when you serve it as a sauce. Thanks for the comment. This salsa is so unique. I'm imagining it on some pork tacos. The cherries here are perfect for this. I must confess to being partial to cherries in sweets, but I should expand into savory, since I do love a good salsa. You and the Mrs. witty banter cracks me up. Hope you have been well. Hi Mary Francaes, pork tacos is an outstanding idea! Love it -- and I'll try it. Thanks for the comment. Hi Gina, glad you enjoy the dialogue. ;-) Cherries really do make an interesting salsa. Just a nice change from the usual. Thanks for the comment. Is there any time of year that's better than cherry season? I haven't had a fruit salsa, but I'd love to try this one. John this dish is outstanding!!! The flavor must burst in your mouth. I can see this with so many dishes or served alone. Great recipe! Thank you for sharing. I'm always happy to add another cherry recipe to my repertoire! And this looks fantastic! I could jump in the bowl and swim in it, it looks that inviting. What a glorious color! It's as vibrant to look at and I am sure it is to eat. What a dazzling salsa. Well done! Hi Beth, cherries are so wonderful, aren't they? We've been making all sorts of treats with them. ;-) Thanks for the comment. Hi Vicki, the flavor really is great. And you're right there's loads of ways you can use this. Thanks for the comment. Hi Greg, :-) Steal away! It's worth it. Thanks for the comment. Hi Liz, I don't think it's possible to have too many cherry recipes! And this one truly is good. Thanks for the comment. Hi Carol, isn't the color great? And wait until you taste it! Thanks for the comment. Oh you clever you!! This is my childhood favorite dish.. not the exact same ingredients, but a Cherry chutney that my grandma used to make. She also used to make a cherry pickle.. with indian spices.. When I meet Dad this time, I am going to try and make the pickle and share. Gorgeous and such a fantastic dish! Hi Ansh, chutney and salsa are rather similar, aren't they? Usually different ingredients, but the effect is much the same! Glad to bring back happy memories. ;-) Thanks for the comment. I've been on a pork and peach tear lately and I'm loving the idea of pork with a cherry salsa! Fresh cherries can't be beat and I'm guessing this salsa is delicious. Gotta try this one, John. Thanks for sharing! Hi Bill, you've been doing really good stuff with peaches (and bourbon!) lately. ;-) This is really worth trying -- I think you'll like. Thanks for the comment. I love sweet & spicy,,, this salsa has me drooling! My husband loves all things cherry! I will have to make this for him! I think I'm part cherry I love them so much! Great idea to use them in savory applications! Hi Pam, this salsa definitely is drool worthy! I need to make it again. ;-) Thanks for the comment. Hi Ashely, your husband will go nuts for this! It's incredibly good. ;-) Thanks for the comment. Hi Laura, aren't cherries so luscious? And so good in savory dishes! Thanks for the comment. I started adding chipotle to my Thanksgiving cranberries a few years back, yum. This is like the summer cousin. I might just have to grill some turkey this weekend. Thanks for the inspiration. Hi Charlie, if you're ever able to find the canned chipotles (preferably in adobo sauce) do pick some up -- their flavor is wonderful! Too bad they're so scarce in Australia. This dish is wonderful -- do try it with pork, and maybe a nice big Australian Shiraz. Thanks for the comment. Hi Jeri, I've done that too! Jalapeno more often, but chipotle is so nice. And you're right this is its summer cousin. ;-) Grilled turkey is wonderful -- I haven't done one of those in years, and am actually thinking about it for July 4th. ;-) Thanks for the comment. Wow, I loved this dish. Lovely colour! 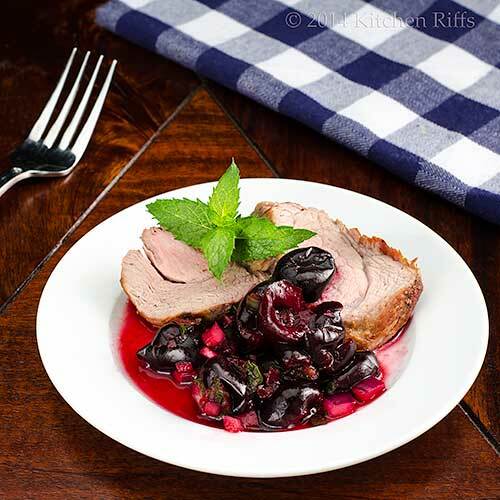 Cherries can be transformed to such wonderful dishes and here's an example! Thanks for sharing, John. Wow! I haven't made anything with cherries yet this summer (gasp! ), but this will be the first thing I make...it looks great! Hi Purabi, isn't the color great? And the flavor is wonderful! I love this dish. ;-) Thanks for the comment. Hi Kristi, you've been kinda busy, so I can understand why you haven't used cherries yet this season. Loads of good dishes ahead of you! Thanks for the comment. I love your ending conversations. I just picked some blueberries and was amazed at the fruit salsas I saw online. I bet this cherry version is great on roast pork. Ooh! What about a pork taco? Hi Debra, really like the pork taco idea! And I'll bet blueberry salsa could be wonderful! Thanks for the comment. Cherry salsa!!! sounds so wild and innovative. I've never tried this combination before but it worth trying for sure. Thanks John for the inspiration. Hi Amira, it's really a good dish -- loads of flavor. Plus it's pretty! ;-) Thanks for the comment. Hi Lydia, isn't this nice? Really goes well with the pork. Thanks for the comment. Hi Nazneen, wow. Cherry pullao? My mind boggles. I so want to see that recipe! Thanks for the comment. I like the spicy and sweet together! Homemade salsas are a fave of mine. Hi Ashley, I agree that spicy and sweet play so well together! Really a nice combo. Thanks for the comment. Looks like a wonderful, very creative combination of textures and flavors. Never thought of combining cherries with spicy but your salsa is the living proof that this works great together. I was just thinking about cherries and how I need to bring some home! I love the mix of sweet and spicy in this salsa. It would be great something smoky off the grill too. Ohhh - this looks delicious! I've had a lot of different fruits salsas before, but not cherry. What a great idea! We've still got a few weeks before cherries are ready here, but I'm looking forward to them. Wow! I have never thought of using cherries in salsa. I can see using this with pork or chicken. Sounds wonderful!! Hi Daniela, cherries and spicy work incredibly well, at least IMO. Certainly this is a wonderful dish! Thanks for the comment. Hi Lisa, this would go so well with a smoky something from the grill! Thanks for the comment. Hi Amy, this is such a good dish -- loads of flavor, and quite pretty. And local cherries are the best! You're lucky you can get them. Thanks for the comment. Hi Dawn, this is outstanding with pork in particular but also chicken. Really good stuff. ;-) Thanks for the comment. I love the dark, rich color this salsa adds to your chicken dish. You see mango and peach salsas all the time. I love this colorful twist. Hi Kristi, isn't the color of this great? And the flavor is even better! ;-) Thanks for the comment. Hi Raymund, isn't this a fun salsa? Loads of flavor -- cherries work so well with spicy stuff! Thanks for the comment. To be honest, if this was served in front of me, I'd be hogging this dish and I am confident I'd finish the entire thing. 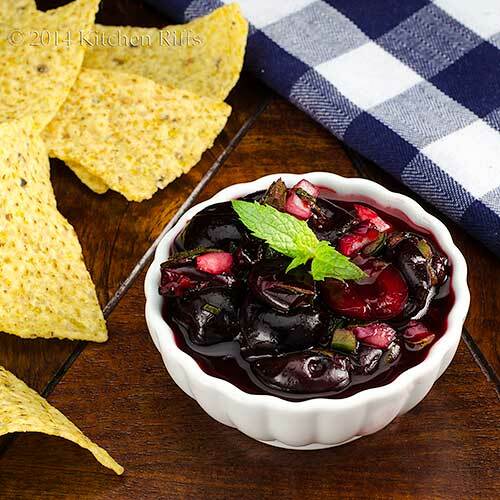 How brilliant to use cherries for salsa. Never heard of and best salsa recipe this summer! Two thumbs up!!! I think this could quite possibly be the best recipe I've ever seen!! Hi Nami, this is so worth trying! Really fun flavor. ;-) Thanks for the comment. Hi Candy, gosh, what a nice thing to say! Thanks for taking time to comment. As much as I love cherries, they don't love me but this dish was too beautiful to pass by without comment. Just gorgeous. Hi Suzanne, too bad you can't eat cherries! At least they're so nice to look at. ;-) Thanks for the comment. Great recipe John. I will have to give it a try. Hi Madonna, isn't this a fun recipe? So good! Thanks for the comment. John, I love both cherries and chipotle. I never thought of such a combination, but I'm sure the spiciness of the chipotle would balance nicely the sweetness of the cherries. Hi Fran, this is such a terrific combo! Nice for a savory dish, and I'll bet it'd work for a sweet one too (well, with adjustments!). Thanks for the comment. We have a store in Colorado called Colorado Cherry Company, sells all things Cherry. I bought some of their Chipotle Cherry Salsa and loved it. Thanks for reminding me that I wanted to try to make it in my own kitchen... and the recipe. :) Pinned. Hi Lea Ann, chipotle cherry salsa is great, isn't it? Such a wonderful combo of flavors! Thanks for the comment. Whew! I made it in time to wish you a very Happy Birthday on your birthday!!! Wishing you a wonderful birthday year John. It has been wonderful getting to know and of course Mrs. K.R. too. Hope you had a glorious day! I'm sipping your birthday drink "as we speak:)"
This is fantastic. I love cherry salsa so very much. I can't wait to try yours. I have a weakness for chipotle. Hi Kim, don't you just love cherry salsa? Particularly with chipotle? Such a great flavor! Thanks for the comment.